This is a collection of subhashitas from Sanskrit literature, with English meaning. Subhashita is an epigram in Sanskrit. A two or four lined verse conveying a thought is Subhashita. It is a good (su), saying (bhashita) conveying a comment on weirdness of human behavior, poetic imagery or an instance of close observation. The book does not have additional references. Who is the author? Publisher? Do you have further information? It would be fair to the editor/publisher to give that information as well, Importantly it also helps in referencing work and hence making it more useabale. Is it possible to get that information from your source? Please try to understand. it is not that I know who the author is and still am withholding the information to take credit for the same. You might have seen that, the name of the author is given in all other entries in this blog (9 out of 10). In this case, this book had never been printed. This was given to me by a friend as a doc file. I just changed the Sanskrit font (I tried to improve its appearance). That’s all. If you (or any one else) know the author please let me know. I am glad to give that information on this blog. Thanks for suggestions and criticisms. PS: I hope you know that Subhashitas are like quotations in English. 300 subhashitas do not belong to one author. They may be from hundred of books like chanakya neeti, bhartihari’s nitisataka, ramayana, mahabharata, kalidasa, etc. I hope my reply is helpful. Thanks for the response, I appreciate it. I am well aware that the subhashit collection is from a variety of sources and given the rich and ancient history of Sanskrit literature, some may not even have an “author”. I asked you in my question who the editor/publisher is, of the collection. This helps in quoting, referencing etc. Its just that someone probably collected these with a _lot_ of labor, it would be right to address the source, just as you mentioned, how you yourself received it. You took the time and effort to edit/make them presentable for the rest of us to benefit from and that is sincerely appreciated. Given that you received it from your friend, I understand how they were compiled. Perhaps you could put that as an explanation? Just a thought. ‘300 Subhashitas with English meaning’ from the link. I checked the link. It works smoothly. Still I will send the ebook to you by email. I would like to learn amarakosha, subashita shlokas with their meanings. Please send the text material for my study and reference. Sir, You can download an ebook containing 300 subhashitas from the download link provided at the bottom of this post. Amarakosa is also available elsewhere on this blog. Please search. It is easy to find. I was searching for site like this for quite sometime. Thanks for maintaining this as no-nonsense site. plssssssssssssss mail this book to my mail(lalitbhardwaj69@yahoo.com)..i cant go to download link due to some fortiguard filter in my hostel’s server..i will be grateful to you.. I have sent you the e-book by mail. please mail this to me.. I have mailed the file to you. Hope you enjoy it. Thank you very much for the great help. It is immensely useful for the readers. Hello, i want these all shlokas but unable to get it. i can see the first page only. how i get all the shlokas? please help. Looking forward to benefit from this forum. Thanks. I am not able to download the file. Can you please email it to me ? 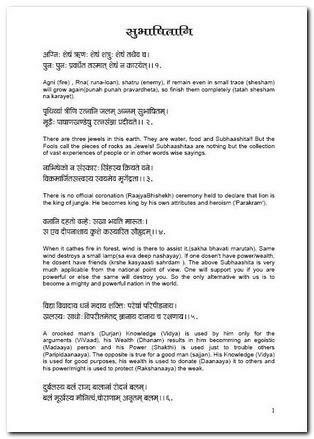 A PERSON WHO READS THIS IT SELF CAN ATTAIN MOKSHA. THEN THINK ABOUT A PERSON WHO ASSIMILATES THESE VERSION&THERE IS NO WORDS TO EXPLAIN ABOUT THAT PERSON. What you did is a great devotion. It not only spreads the knowledge but also highlights the Indian culture. Sir, Namaskaram I’m unable to download the file ” Subhashitas with English meaning”. Could you please mail the same to me. Divya Kumar, I have rectified the download link. You can download the file now. “madhuna koderasthena nimba kim madhurayathe” are available in which book. Right now I am feeling so cool to see that I am not the only one to love Sanskrit literature. Many of my friends just to learn for the sake of scoring good in the board exams. But now the deed is done , they make fun of me for reading so. Happy to see that our Ancient Aryan culture has not been forgotten and will never be. Kudos!!!! Please send e book containing 300 subhashitas. Thanks. I cheched the download link. It is working. please give link for sarthshrimahabharatsubhashitani. You can download Sartha Subhashitani from the link given below. There are 4 books by the same author in this collection. It contains sartha mahabharata subhashitani, Ramayana subhashitani, Bhagavata Subhashitani and Yoga Vasishta subhashitani. Unable to download the e-book from the link. Please send e-book containing 300 subhashitas to carajeshkumarc@gmail.com Thanks. Thank you very much for this book! My friend and I have embarked on the journey of learning sanskrit in a year, and we read one subhashita each day from this book to end our discussion session. With each day, the subhashitas get better, with deeper metaphors and word play. We are grateful and thankful for this open-access book! I hail your work in uploading these 300 Subhashithanis. It is difficult to know either. The readers should understand the fact that most of the Subhashitas we find in Sanskrit are just compilations from various authors.. or from sayings and slokas which are in wide circulation traditionally but without any indication about the exact author.. The contents are rather important and not the author..Even great treatises like Subhashitaratnabhandagaram… have quotes of anonymous nature..
And it is often found that the same quote is found in many works of different authors, and in different works of the same author.. Even slokas of similar words can found both in Kalidasas Kumarasambhavam and Raghuvamsham.. So to be running after the identity of the authors without time to enjoy the substance and content of the work is rather a futile attempt..